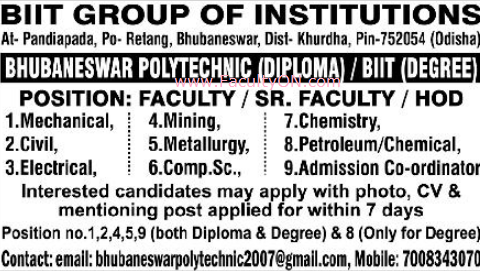 Bhubaneswar Polytechnic & BIIT, Khurda has advertised for the recruitment of Teaching Faculty, Senior Faculty and HOD jobs vacancies. Interested and eligible job aspirants are requested to apply within 07 days from 23rd November 2018. Check out further more details below. About College: Bhubaneswar Polytechnic plays a vital role in the era of Odisha's educational revolution. Under the efficient and able leadership of our respected chairman Sri Amiya Badjena it spreads the essence of quality education and technical training in Odisha as well as other states of our country. Bhubaneswar Polytechnic are the part of BIIT Group under Odisha Child Welfare & Education Trust. By its innovative planning of high value classes, excellent faculties effective study material,power packed teaching method, effective placement planning creates an educational revolution in Eastern India. How to Apply: Interested and eligible candidates are requested to send application along with their CV, copies of certificates and PP size photos to the following email address, mentioning the post applied for in the subject of email.